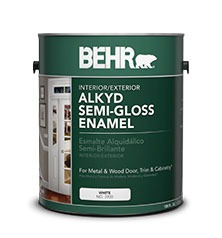 If you’re painting cabinets in a home you’re already living in, use a waterborne alkyd paint. This paint creates a glass-like finish that doesn’t show brush or roller marks and will hold up to your day-to-day wear. We loved the Benjamin Moore Advance Waterborne Alkyd Paint for kitchen and bath cabinets. Benjamin Moore recommends this paint formula for giving cabinets a furniture-like finish. There are also very similar products from Sherwin Williams and Behr. Since we first wrote this post in 2016 we’ve found an even better paint for painting your cabinets! Alkyd paints feel like an oil-based paint when you’re using them, with a nice smooth flow and self-leveling. They also have the benefit of low VOCs like latex paints and clean-up with soap and water. I’ll be fine if I never have to use paint thinner or mineral spirits again. If you have any specific questions or out of the ordinary applications, leave a comment below or contact us and we’ll try to help you make the right choice.